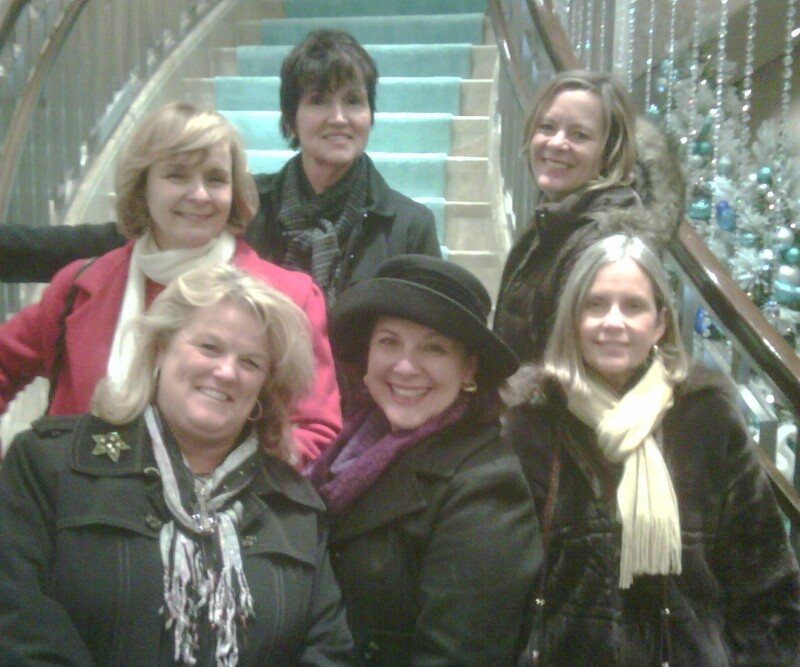 Sometimes a girl just needs to have fun, and if it’s in New York City with good friends, that’s even better! “How long were you there? A week?” That was Tim’s question when he overheard me telling Lisa about the things we did in New York City a few weeks ago. We were only there from Thursday about noon until Saturday around 3:00 p.m., but we managed to make use of every moment. If you want to read a travelogue of six women’s experiences in the Big Apple, read on. You might get some good ideas about what to do when you visit the City. We flew out of Myrtle Beach on Spirit Airlines, an experience that was grand in every way. Well, almost every way. If you want a soft drink, juice, or coffee, you have to pay for it. Gone are the days when those frills are free, at least with Spirit. At the same time, Spirit is more affordable than the giant airlines, and it’s virtually hassle-free. The ride was smooth, and the people were friendly. Upon arrival at LaGuardia, we easily found the baggage claim area where we retrieved our bags and then went outside to hail a taxi. Fortunately for us, we quickly found a little yellow station wagon that carried all of us. We oohed and aahed our way into the city as our small-town eyes drank in the sights around us, and if I recall correctly, we especially loved the bridges and tunnel. We checked in at the Staybridge on 34th Street (high recommend this establishment) and rendezvoused with Mary, a friend of Jeanita’s who lives in New Jersey. After checking with the Staybridge staff for directions, we headed out in search of the Westway Diner. My husband and I had spied Brooke Shields while eating there in May, and we were halfway hoping for another celebrity sighting. If that didn’t happen, I knew the food would be good…and it was. I love the ambience of Westway. From the black and white tiled floors to the magnificent service, it’s a grand place to eat. Tummies full, we walked to Macy’s for a little touristy-type behavior. 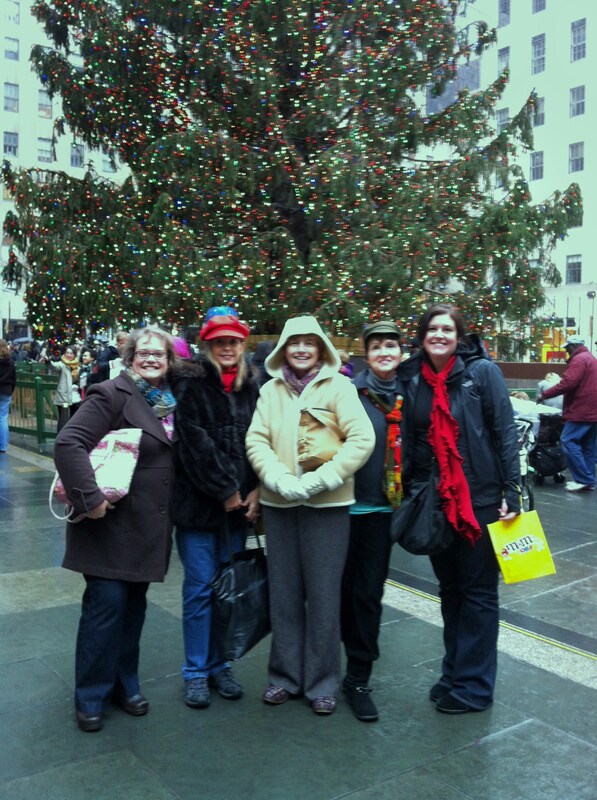 We gawked at the window displays, enjoyed the sights of Herald Square, and did a little shopping for hats and gloves. While in Macy’s, I inquired about Tiffany’s location in relation to where we were, and since it was going to be open until 8, we decided to ride the Subway there. With Mary’s help, we made it there and back. The area around Tiffany’s is far different from that around Times Square, not better but different. Connie and Tilara took numerous pictures of the beautiful street decorations, and then we went inside. Although they were incredibly busy that afternoon, there was still an almost formal feeling in the air. We loved the pale blue carpeting and uniformed “guards,” one of whom agreed to take our picture. We spent most of our time on the third floor drooling over sterling silver, and after making our tiny purchases, we rode the subway back to the Staybridge. 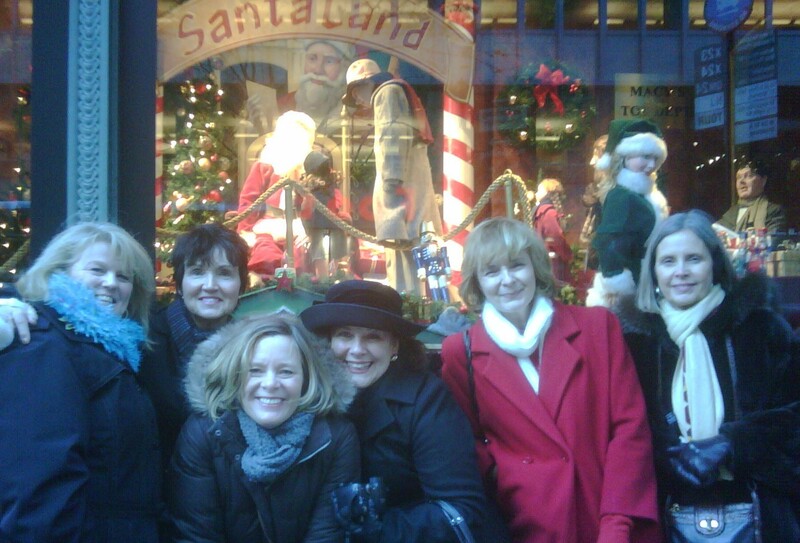 After a little primping and preening, we headed out to the Rockefeller Center area to see the famous Rockettes at Radio City Music Hall. In a word, fabulous. 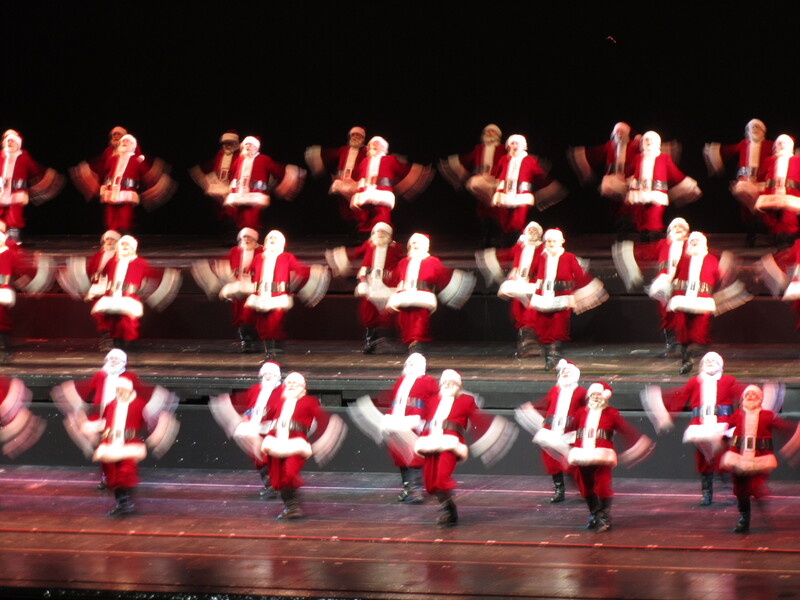 I fell in love with Santa and felt like a kid mesmerized by his laughter and rich voice. Anyone who could sit through such a delightful performance and not be in the Christmas spirit would have to be a first-rate Scrooge. All our walking and sightseeing left us hungry so after leaving Radio City, we walked to one of my favorite Manhattan restaurants, Junior’s. I’m not sure what it is that I like about that place, but well, maybe it’s the generous portions of good food. Or it could be that the staff is friendly and helpful. It’s a busy, buzzy place with a lot of energy and a big city feel. That night, we were there until 12:30 a.m., and as the restaurant was nearing closing time, the employees presented the hostess with a birthday cake and a song. Nice way to end a perfect evening. The next day was even better. Stay tuned.